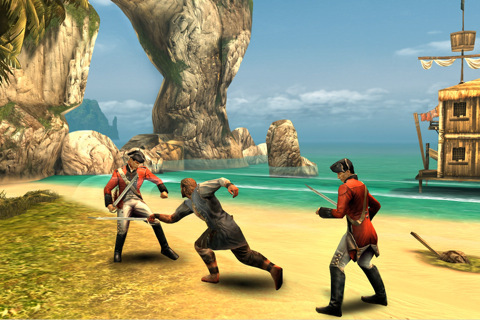 Gameloft’s BackStab [$6.99] was released for Xperia Play a few months back as a timed exclusive, but now that it has finally arrived on iOS as a universal app, we get to take a look at the studios take of Assassin’s Creed via Pirates of the Carribbean. Which is to say, it’s an open world action adventure game with lots of jumping around and stabbing things. 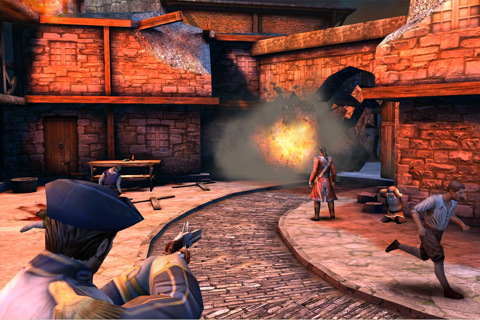 The core of the game relies on the same parkour and action mechanics of the Assassin’s Creed games on consoles. That means the bulk of the game requires you to run around a somewhat open world and jump from object to object. Control wise, you’ll get a virtual thumbstick and some buttons to control sword swipes and jumping. Combat is a button mashing affair and while you get some counter moves, you don’t get a block, so most battles can be won by hitting the attack button repeatedly. Touching and scrolling anywhere on the screen moves the camera around. It’s tolerable, but there will be plenty of instances where you miss jumps, balk stealth sequences or attack thin air because you can’t quite get the camera settled properly. The same goes for free-running, which only works in certain contextual situations. Occasionally you have to push the jump button and sometimes the game does it for you. It’s confusing at best, unpredictable and annoying at its worst and you’ll die a lot if you don’t get the hang of it. You’ll be doing all of this dying, running, jumping and stabbing across several locales in what can only be described as one of the most insane, brain-melting stories I’ve played through in a long time. From the outset, you play as Henry Blake, an officer in England’s Royal Navy who ends up with a faux-hawk and a badass biker jacket after being double-crossed by a man who was apparently an old friend. This puts you into shackles, gives excuse for a daring escape and eventually provides the reasoning for the crux of the story, your revenge. To get your revenge, you’ll kill chickens and rabbits to make food for a buxom lady, run errands for random people and explore a few different Caribbean Islands in a series of missions only slightly related to the main story arc. I’m wary to “spoil" the strangeness the game takes on around its mid-point, but let’s just say it pulls an Uncharted and goes off the rails of reality and spills into something totally different. This wouldn’t be a big deal if it made a lick of sense, but the game seems to push you to want revenge, not to run around caves searching out different artifacts to reverse an infection. The world simply doesn’t justify the twist, but it’s a point only a few will likely quibble with. As far as the open-world is concerned, it’s a mix between Assassin’s Creed and Red Dead Redemption, in that you’ll be running around and taking on missions from random people, saving people from being killed by the Spanish and picking flowers. The kitchen sink approach is admirable, but the game is so buggy it’s difficult to really dig into. If you can deal with it, there is tons of content to explore, even if it’s all a bit familiar. You can play through the main storyline in about four or five hours, but if you explore the extra missions and side stuff, there is plenty of gameplay to be had. The engine is likely the place to put the blame for the bugs. Characters will fall through the ground, get stuck in jumping loops or disappear altogether. 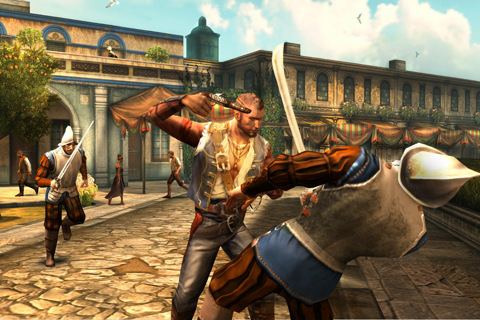 Design wise, several of the NPCs seem pulled directly from Assassins Creed II, but the low polygon count and often humorous animation means you’ll never really mistake this for anything but a mobile game. While those are minor annoyances and are mostly expected in open world games, they happen far more than they should and even worse, happen to your own character sometimes. The game does a decent job of magically pulling you out of stuck corners, but I had to restart a few times after getting trapped on a ledge or in a wall. That said, BackStab runs well on the iPad and only occasionally chugs on an iPhone 3GS. Control-wise, it’s far better suited for the iPad’s bigger screen and you’ll likely be accidently touching buttons far more often on an iPhone. The world looks great on all of the devices, even if the characters don’t. The characters are fully voiced, but the dialogue isn’t particularly noteworthy and the voice acting, while an admirable inclusion, doesn’t really add to the experience. For their part, the sound effects and music do a good job of sounding like what they’re supposed to, but don’t plan on being blown away by the sound design or the acting. It’s better than previous Gameloft titles, but still has a lot of room to grow. If you’ve been desperately craving an Assassin’s Creed game set in an 18th Century pirate wonderland to play on the go, this will do the trick, but don’t expect too much from it. If you can deal with all the bugs, you’ll certainly be taken on a bizarre ride and you’ll have a ton of stuff to do in the world.